Click above to watch a short video about Barbara and her sculpting process. Concrete is a very organic medium it’s texture is the characteristic I value most. The color palette is influenced by stone statues native to the concrete jungle of my childhood. Sculptures vary from the sole medium of concrete to adding elements of found objects that are often the inspiration of the piece. My love of feathers has also found their way into many of my pieces, combining the lightest and heaviest of elements. Subjects are primarily faces of our world and occasionally creatures from another. 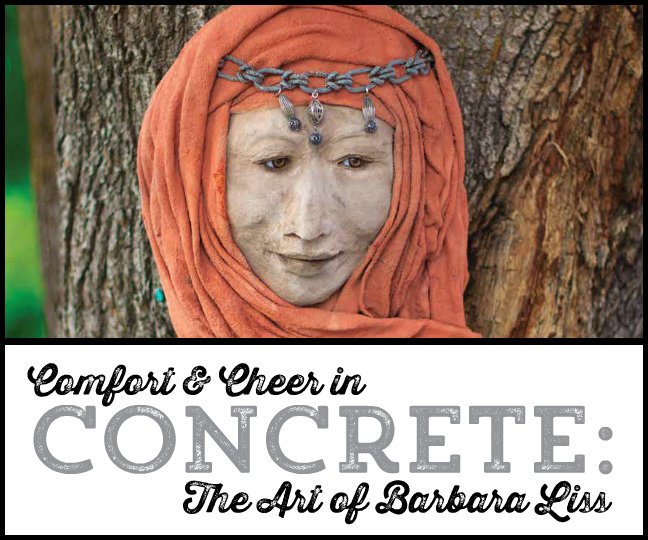 Concrete sculptures are at home in the inside and outside environment, placed wherever they inspire. My sculptures speak to me as we become friends in the sculpting process telling me who they are or what they are thinking. When they're done, my brother, Dan Liss writes about what each piece is expressing. I create the visual story while he creates the written one. Faces can comfort and cheer us and in concrete they will endure. Click below to see my Featured Article in Distinctly Montana Magazine! Owning a property management real-estate company for 32 years I was able to use my artistic instincts to remodel homes and make additions to them, using my vision of what could be. I incorporated the beauty of landscape enhancement where ever I could; as our outside environment is as important as the inside environment. My art of sculpted concrete can be enjoyed in either inside or outside living spaces. Owner, Montana Bliss Artworks. 2018 Matzke Fine Art and Sculpture Garden - Camano Island, WA. Each hand-sculpted concrete piece can be enjoyed in any setting from wood piles and rock walls to fountains and flower beds. These friends welcome visitors on woodland walks, in gardens, and are sure to provide good company and whimsy wherever they may be.